A great opportunity to visit Santa Barbara's wine country after a business trip to LA on Veterans day November 2017. A tasting tour was organised with Sustainable Wine Tours based in Santa Barbara to visit the Dragonette, Pence and Spear wineries. Brian was a fabulous host, very knowledgeable and they are highly recommended if you're in the area. Buellton is in the middle of the Santa Ynez Valley, just off of Highway 101 between the Santa Rita Hills AVA and the Santa Ynez Valley AVA. The area is famous because of the 2004 movie Sideways, directed by Alexander Payne and written by Jim Taylor and Payne. It was a film adaptation of Rex Pickett's novel and follows two men in their forties, Miles Raymond, a depressed teacher and unsuccessful writer and Jack Cole, a past-his-prime actor. They take a week-long road trip to Santa Barbara County wine country to celebrate Jack's upcoming wedding with hilarious consequences. As a result of the movie, the whole area (Buellton, Solvang, Los Olivos and Santa Ynez) became firmly established on the wine map. For myself this was a pilgrimage as seeing the film all those years ago got me interested in wine and particularly in Pinot Noir. The Windmill Inn in Buellton featured in the film is now called the Sideways Inn. Dragonette Cellars is based in Los Olivos and was founded by brothers John and Steve Dragonette, along with their best friend, Brandon Sparks-Gillis. John and Brandon met working for famous Los Angeles wine store Wally’s and John’s younger brother Steve then joined them. They originally started producing wine in a garage before moving to their current Los Olivos site. It was a great opportunity to try their Sauvignon Blanc from Happy Canyon of Santa Barbara AVA, Pinot Noir and Chardonnay from the Santa Rita Hills AVA and MJM (Syrah, blended with small amounts of Grenache and Viognier). The Pinot Noir 2015 had a beautiful nose, with complex palate. Nice balance of fruit, acidity and tannin making it very enjoyable and easy to drink even at this young age. Pence Ranch Vineyard is located in the far eastern portion of the Sta. Rita Hills appellation, after an expansion of the AVA was approved in August 2016 (1909 West Highway 246,Santa Rita Hills). The winery had its first release in 2010 . Around 40 acres are planted on the 200-acre property with elevated vineyards exposed to cold winds and morning fog from the Pacific Ocean. As well as wine, they raise cattle, grow grain and produce olives. Lovely vistas, pleasant outdoor tasting area make this a great place to visit. Geologically, the land comprises a complex collection of several different virgin soil profiles, including Tierra, Linne and San Andreas Series, all of which are unusually dense and permeated with a variety of rock, calcareous (limestone) material and clay. Because of the nature of its topography, there are also several different sun aspects and variable slopes within the vineyard, making the soils all well-drained, but of varying compositions in different locations. There was an opportunity to taste their excellent Chardonnay and Pinot Noir. 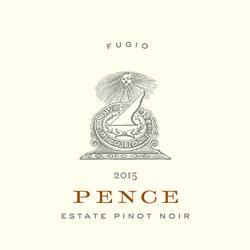 The 2015 Fugio Pinot Noir is from a four-acre block of cane-pruned Pommard situated on steep, west-facing slopes, with dense clay and limestone soils. Because of the FUGIO section’s steep curvature, the ranch only select fruit from the top half of the block because the drainage and wind-pressure are greatest there, delivering more concentrated fruit and richer wine. Aged for 16 months in 30% new French oak. 100% whole-cluster fermented in concrete. Powerful aromas with concentrated and complex fruit on the palate. The 2015 Estate Chardonnay is a field blend of six different clonal selections. The vines are north-facing, so they receive less sunlight, and are grown on a mixture of various ocean sedimentary soils including limestone, diatomaceous and calcareous elements. Because of the bright sunshine throughout the growing season, competing against the cold winds coming from the Pacific Ocean the wine has a freshness and depth of flavours. Barrel fermented and aged in 25% new French oak puncheons for 16 months. Full ML and no battonage. 13% alcohol. Nice minerality, fresh without a full expression of fruit. On this visit in November 2017, the tasting rooms had only been open a month with the winery releasing its first wines. A fantastic hill top location and impressive tasting room. Unfortunately the wines and staff did the winery no favours and compared with Pence and Dragonette, a disappointing experience. There was an opportunity to try Chardonnay, Syrah and Pinot Noir. The latter lacked complexity and was one of the most opaque Pinot's I have ever seen in the glass. Spear is a fabulous location but the wines need more work and the tasting staff need to enhance the experience when presenting the wines.